This discussion provides reference material found helpful in understanding the battle against man made radiation in all of its forms. From power lines in your home to cell towers of powers vastly exceeding what is required, these forms of radiation are quite simply "Death Rays". I am no longer going to hold back. I have been at this campaign since my experiences as an Electronic Warfare Officer for the U.S. Army in the 1970's. I tried to start a company in the 1980's to measure Death Rays in homes and businesses but no one wanted to listen. By 2004 my brother Phil was dead from a glioma brain tumor directly linked to cell phones. This subject is very personal. For more information: see Shungite Blog. This is game changing information CLICK. "The U.S. National Toxicology Program (NTP) is expected to issue a public announcement that cell phone radiation presents a cancer risk for humans....Discussions are currently underway among federal agencies on how to inform the public about the new findings." It should have been a moment of celebration. Instead it made me angry and brought tears. It has taken 40 years, the life of my brother Phil who died of glioma and the lives of uncounted others. It was NEVER a secret. It was just denied and all too many went right along with the killings, for whatever reasons they can create to make them feel okay about themselves. I am still angry. Based on the evidence... it appears that humanity is killing bees at an alarming rate. However, we are not just killing bees. We are killing ourselves. We are electrical and electromagnetic beings. These artificial EMFs, although silent and invisible, are affecting us too, as those who are electro-sensitive can attest. The bees may be warning us before it’s too late, before we bathe our entire world in an artificial EM blanket from which it’s impossible to escape. Utilities around the country are installing millions of "smart meters," devices which use wireless technology to send information back to the companies about power usage by their customers. But there's a growing body of scientists deeply concerned about bathing the public in low-level, non-thermal radiation, and they say the smart meters pose the greatest danger of all. FROM THE REPORT: "Customers are not being informed how their constitutional rights are being violated for the purposes of a for-profit home surveillance network. Nor how this technology has caused thousands of fires which have resulted in several deaths. Nor how our bodies are being affected by pulsed microwave radiation exponentially stronger than cell phones, as shown in Take Back Your Power. If there wasn’t an avalanche of facts to back all of this up, it might sound too unbelievable to be true. But we live in strange times." The bold-faced truth about Smart Meter microwave emissions—live cell phones, too—is that EMFs are constant: 24/7/365! However, you can’t turn off your Smart Meter like you can your cell phone, .... In the Smart Meter EMF monitoring testing that I witnessed, an AMI Smart Meter emitted very high pulses every 15 seconds, so how often is that in an hour? - Four (4) high-spike frequency EMFs/RFs are emitted every minute. - 2,102,400 high-spike frequency EMFs/RFs, every 365 days. That goes on year after year, too! ​1k+ Hz coming over 60 Hz-designed electric wiring definitely is NOT safe! 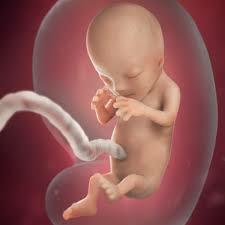 ​Can Radiation Harm Your Unborn Baby? And this article only gives a portion of what could be said. Please, get your FREE copy of this extraordinary E-Magazine - It's Your Life. You will find informative articles written by talented and knowledgeable individuals. - Beginning on page 22 is the article on EMF. - On page 24 begins an article on Shungite. ​Joyce Wheeler of the It's Your Life team, has a weekly and monthly show on Wolf Spirit Radio. See page 46. For the most current testimonials from Shungite users and information on dangers Shungite can protect you from, please join the Shungite Store Group on FaceBook. "heavy users" of cell phones had an approximately doubled risk of glioma, a life threatening and often-fatal brain tumor, after 10 years of cell phone use. Mainstream media in many countries reported on this news story, and the story went viral on the Internet. More recently, students in a few countries replicated the findings of this study, but pundits dismissed the results. Make no mistake about it: We are 'electrical beings' and, since WWII, the proliferation of electrical power lines and wireless technology has placed an enormous stress on our biological systems. "As far as what this stuff is doing to your child’s brain, take a look at the picture below. These are brain scans of people who spent a few minutes talking on their cell phones. 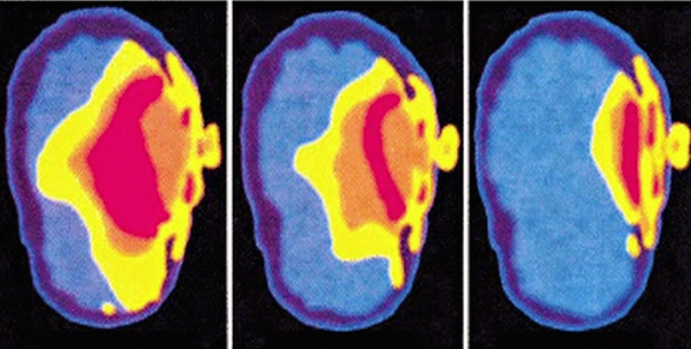 On the right, the adult brain absorbed a decent chunk of radiation, but to the far left you will see a child’s brain, which absorbs more than 4 times the radiation than that of an adult.​"
Microwave generating equipment first became common during World War 2 with the development of radar. Soviet bloc countries reported that individuals exposed to microwaves frequently developed headaches, fatigue, loss of appetite, sleepiness, difficulty in concentration, poor memory, emotional instability, and labile cardiovascular function, and established stringent exposure standards. 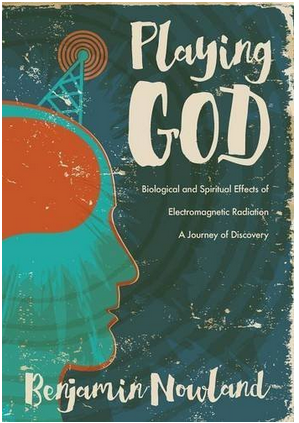 For a variety of reasons these reports were discounted in Western countries, where the prevailing belief was that there could be no adverse health effects of electromagnetic fields (EMFs) that were not mediated by tissue heating. The reported Soviet effects were at lower intensities than those that cause heating. However, there were several accidental exposures of radar operators in Western countries that resulted in persistent symptoms similar to those described above. The Soviets irradiated the US Embassy in Moscow with microwaves during the period 1953-1975, and while no convincing evidence of elevated cancer rates was reported, there were reports of "microwave illness". Officials passed these complaints off as being due to anxiety, not effects of the microwave exposure. There is increasing evidence that the "microwave syndrome" or "electro-hypersensitivity" (EHS) is a real disease that is caused by exposure to EMFs, especially those in the microwave range. The reported incidence of the syndrome is increasing along with increasing exposure to EMFs from electricity, WiFi, mobile phones and towers, smart meters and many other wireless devices. Why some individuals are more sensitive is unclear. While most individuals who report having EHS do not have a specific history of an acute exposure, excessive exposure to EMFs, even for a brief period of time, can induce the syndrome. Raise awareness through a new educational curriculum. Students, teachers, and their families should be given information on wireless health risks and the steps they can take to protect their health. Children need to be taught how to use technology safely and more responsibly to protect their health and well-being. Install a safe communication and information technology infrastructure in schools. Low-EMF hard-wired Internet connections, which are also faster and more secure than wireless devices. Our children do need to be protected in the school environment, but don’t wait for governments agencies to take action. Talk to your school officials today and be part of the solution. ​When the mainstream media starts reporting...its time to pay attention because it is an issue that we all intuitively know is affecting us all. As more young children are getting their hands on cellphones, more pediatricians have growing concerns over how increased cellphone use may be impacting their health.Even when you're not talking on your phone, cellphones do emit radiation when they're connected to the internet or searching for a signal. Today Show news focusing on safety of cell phones. "Children are not little adults," Dr. Gisela Mercada-Deane, chair of radiology at the American Academy of Pediatrics, said. "The amount of radio frequency that children will be exposed by the time they are our age [an adult] is exponential to the amount of radiation, radio frequencies that we ourselves are being exposed to in a lifetime." New AMR alternative to smart meters still spews 'dirty' electricity, harmful radiation. If you could see it what would you see? Beck Natural Medicine is a health and wellness research institute dedicated to state-of-the-art healing modalities from around the world We have a truly holistic -- body, mind, spirit -- approach to wellness. The list are links to take you to information on many different health issues.